Courchesne, E, R Carper and N akshoomoff. 2003. Evidence of Brain Overgrowth in the First Year of Life in Autism. JAMA 290: 337-344. Courchesne et al. present data linking autism to an unusual pattern of brain growth shortly after birth. Infants who later develop autism have a slightly reduced head circumference at birth, compared to normal infants, but undergo a rapid spurt in growth during the first two years of life. This growth spurt is so strong that by the age of 3-4, when behavioral signs of autism are just beginning to show, autistic children's brains are larger than normal. The authors conclude that the causes of autism must therefore lie in factors that lead first to reduced head circumference in birth and the subsequent the rapid spurt in brain growth, rather than factors that are not experienced until behavioral signs of autism are evident, such as exposure to mercury in vaccines. What did they do? Courchesne et al. compared the growth patterns of autistic children's heads with those of normal children, using data from two national studies as reference points. They also compared measurements of body length and weight. The autistic children had all participated in a study of their brains using a non-invasive imaging technique called magnetic resonance imaging. This provided additional details about sizes of different parts of the brain. What did they find? Several highly significant differences emerged in comparing the autistic children with the reference data sets. Head circumference at birth was smaller than normal, although body weight and height were not. Beginning at 1-2 months of age, the head circumferences of autistic children began to grow substantially more rapidly than normal children. By 6-14 months of age, autistic children's head circumferences were substantially larger than normal children's. This persisted through the age of 3-4 years. The graph to the right compares the relative head sizes of autistic and normal children. It shows how much larger or smaller an autistic child's head circumference would be than the average size of a normal child's head at different ages. At birth, autistic children's head circumference is significantly smaller. A rapid spurt of growth starts soon thereafter, so that by age 6-14 months, the head circumference is significantly larger. Significance levels shown for points that differ significantly from normal. Adapted from Courchesne et al. Using their MRI observations, Courchesne et al discovered that the certain brain structures and tissues differed in relation to head circumference and the spurt in growth of head size. For example, smaller head circumference at birth was correlated with smaller amounts of gray tissue in the cerebellum in childhood. Infants that underwent rapid increases in head circumference were more likely to have larger amounts of cerebral gray tissue. Larger head circumference at 6-14 mo age was associated with larger amounts of cerebral gray and white matter, whole brain gray and white matter, and whole brain volumes. 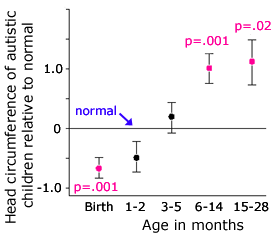 In another important observation, the authors noted that children diagnosed with more pronounced autism underwent more rapid increases in head circumference before 6-14 mo age than children diagnosed with a milder form of autism (known to specialists as PDD-NOS). What does it mean? This study confirms that biological evidence of autism can be found in the brains of autistic children before behavioral indications are apparent, and the first signs are evident at birth. According to the authors, this indicates that factors experienced by children at the age when they begin to show behavioral signs of autism are unlikely to be the cause of the disorder, for example mercury in vaccines. The authors acknowledge that events/exposures during childhood may be important as aggravating factors, but they can't be responsible for its basic causation. The abnormally high rates of brain growth they observed were seen in only 6% of nonautistic cases but in 59% of autistic cases. One variation on their interpretation would be that the high rates of brain growth from birth to 2 years of age are necessary antecedants of autism, but that an additional trigger is essential to inducing the actual expression of autism. Thus children that did not undergo the brain growth spurt would not be vulnerable to exposure to the trigger, whereas those that had would develop autism, once exposed to the trigger. Hence a possible role for exposures during childhood cannot be ruled out on the basis of these observations. Even if these observations do not rule out contributions during childhood, they clearly emphasize the need to understand what factors may be causing autistic children to have smaller head circumference at birth and then undergo rapid increases in brain size over the first 2 years of life. Perchlorate disrupts the action of thyroid in directing brain development. This contaminant is now in the drinking water of over 20 million people in the US. Polybrominated flame retardants have been found to alter the brain growth spurt in mice; PBDE levels have increased exponential in Americans over the past 20 years. Bisphenol A activates genes involved in regulating brain growth. Exposure to bisphenol A has become ubiquitous as a result of its use to make polycarbonate plastic. With these clear results from Courchesne et al. showing that brain growth patterns in the womb and postnatally differ in autistic children, work on possible contributions by contaminants interfering with brain development is now warranted.